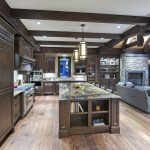 The kitchen is one of the most frequently used rooms in the home; and as more and more homes tend towards open and shared designs, the kitchen is quickly becoming the centerpiece for family gatherings, parties, and other events as well. And that is why many homeowners are looking to turn their kitchen from boring and drag into beautifully designed, luxurious rooms that are truly a highlight of their home’s interior design. If you want to know how to make your kitchen luxurious, don’t worry—you won’t have to spend thousands and thousands of dollars. Just follow these 5 ways to make your kitchen look truly luxurious. The backsplash of your kitchen is an underappreciated area, but once you switch it for a more luxurious pattern or print, you’ll realize how much the backsplash actually matters to the room’s overall design. Changing the backsplash isn’t very expensive, either, so it’s a great way to make your kitchen more luxurious on a budget. If at all possible, make sure your kitchen is open to a lot of natural light sources. Natural light gives a kitchen a much more high-end, luxurious feel, which can be dampened by artificial lighting. You can optimize the natural light in your kitchen by using curtains and blinds that can be easily opened up or even—if you want to spend a bit more money—installing sky lights or other larger window areas. Lighter colors make a kitchen look larger, more open, and definitely more modern, which is why they are the best choice for revamping a kitchen with a luxurious makeover. Paint, wallpaper, or if you want to spend more money, new appliances in lighter colors will definitely make your kitchen look elegant and expensive. 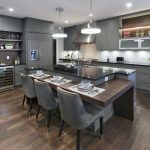 You can still have dark colors in your kitchen, but you’ll want to use them for accents—such as cabinet door handles, accents on appliances, or even kitchen stools—while ensuring that lighter colors are used for the majority of the room. Lighting fixtures, like backsplashes, are really underappreciated in the kitchen—but they can make a serious difference in your kitchen’s overall aesthetic. Most standard lighting fixtures in kitchens are boring and look cheap. For a more high-end, luxurious look, you’ll want to change your old light fixtures out for something new and fresh. Modern light fixtures tend to have bold but simple designs, such as globes, and 3d shapes with brass or silver accents. You can also go for more decorative fixtures, such as chandeliers, which will add a different type of elegance. True, you’ll want to avoid having any priceless pieces in the kitchen, but nothing makes a kitchen look more luxurious than some fine artwork. If your kitchen has a more simple design, you should opt for a bolder artwork for a nice contrast; if your kitchen is busier, and then opt for something simpler so that it doesn’t clash too much.